Main Drive Kew won “Victoria’s Best Overall Development” at the Urban Development Institute of Australia 2008 Awards. Kew Cottages has significant heritage in Melbourne, opening in May 1887 as an asylum for children with intellectual disabilities, the largest of its kind in Australia. The site was criticized based on its lack of funding from the government, overcrowding and insufficient staffing leading to its closure in 2008 with the last remaining residents being moved to Community Residential Units. Now, there are a few buildings kept from the original facility, which have been restored by Walker for their heritage purposes. 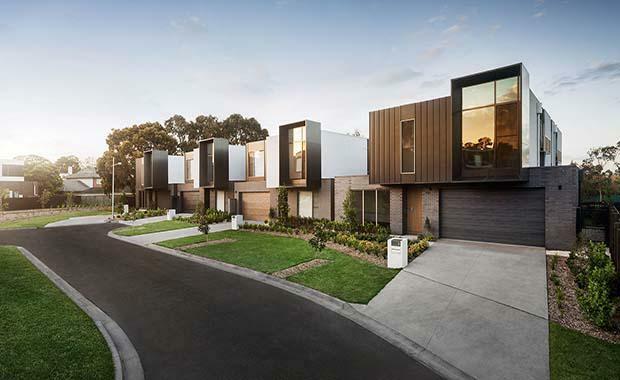 Main Drive Kew is made up of 360, high quality, luxury, sustainable homes and apartments as well as a number of large open spaces nestled among Melbourne’s best schools less than 10 kilometres from the Melbourne CBD. Guided by botanical and heritage studies, Walker has designed the community around the original parklands, vegetation and century old trees. Canny was contracted to build 76 large family homes as part of stages 4, 5, 6 and 7 of the project that were predesigned by Walker Corporation. Canny has worked on the project from March 2012 to June 2014 with a total project value of $75 million. The average size of the dwellings are 365 square metres double-storey, split level homes that include 4 bedrooms and 4 bathrooms. Stage 7 on Monterey Close (at the top of the hill) was made up of larger homes at around 460 square metres over three levels with internal lifts, large format balconies and multiple living zones.